Well sorta, I've been fermenting on this idea for some time, in fact these are just the color studies for the actual piece that is hanging on my studio wall - and it's 9 x 10 feet, yep 9 x 10 feet (which translates roughly into king size for the quilters out there). 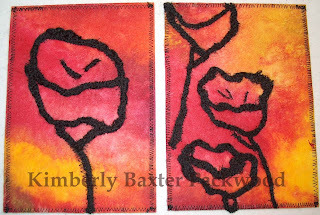 These pieces, Hot Poppies, are a set, free stitching on painted timtex and they really are this bright! I'm making prints and they will be available on my etsy.com store - see little etsy icon to the left. They look much better in person but I am having a hard time with the bright colors and contrast, I actually tried fixing it in Photoshop to no avail. I even scanned them in, they looked really bad then, even with some adjustments to contrast and the like. Tis the bane of photographing bright,high contrast, art.